Designed for installation on your own wood support structure, the FORESTER model includes all the canopies, overhead tracks and mounting hardware to complete the job. Here's the ideal way to coordinate your ShadeTree awnings with the architectural style of your deck and home. The tracks are made of handsome, heavy-gauge, powder-coated aluminum that will provide years of service. 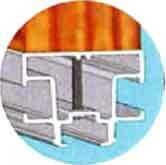 Adapts to existing structures, or design your own. The wood structure can be as simple or as elaborate as you wish. Support posts can be attached to your existing deck, or placed in holes dug in the ground. Or, you can mount the awning system under an existing arbor. As an alternative to our standard, 2-sided aluminum tracks, ShadeTree®, awnings can be mounted between beams using our StripTrack System, or under the beams using our "under-beam-mounted" double-sided track. the deck is comfortable too! Our standard double-sided track is ideal for a quick retro-fit to attach canopies to an existing structure by mounting independently underneath existing rafters. Track placement is not critical and canopies with are typically our standard 60" or 46" widths, but custom widths are available. Our strip track is popular when starting from scratch if you are designing you won pergola or shade structure and want to create more of a custom look. 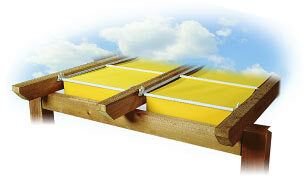 Simply space your rafters based on the standard 60", 46" or 30" widths. Canopies can be custom-cut so they fit your specific needs. Tracks are available in white, black, beige or taupe. The "under-beam-mounted" double-sided track provides a third mounting option where there is an existing structure and it is desirable to minimize the number of tracks and canopies so they align with existing rafters. When the spacing between beams is narrow. 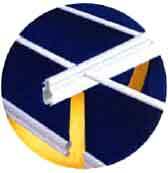 track can be mounted to skip some beams allowing for wider canopy widths. Canopies can be custom-cut so they fit your specific needs. Tracks are available in white, black or taupe.